Photo above: Bill Campbell and Nancy Kopp interview for her job as state treasurer. It was a foregone conclusion that the Special Joint Legislative Committee to Select the State Treasurer would recommend that Nancy Kopp get a fourth four-year term in one of the most powerful jobs in state government. Even the only other candidate interviewed by the committee, Bill Campbell, the Republican nominee for comptroller in the last two elections, expected that outcome. But it didn’t happen without a little drama at the end of the hour-long meeting Wednesday night. Republican Sen. George Edwards of Garrett County proposed that the committee not make a recommendation, but send both names to the joint session of the General Assembly next Wednesday. At that session, each lawmaker will vote in a secret ballot. He was seconded by the other Republican senator on the 10-member committee, Sen. Addie Eckardt of Dorchester County. “We have been charged with coming up with a recommendation,” said Sen. Nancy King. Turns out the Maryland code spells out the process, and says the committee shall recommend one person for the job, but all the qualified candidates will appear on the ballot. Campbell’s resume includes positions as the chief financial officer for the U.S. Coast Guard, Amtrak and the U.S. Department of Veterans Affairs, which has a budget twice the size of Maryland’s. He predicted Maryland will be in “severe financial distress” in the “very near future.” He is particularly concerned about the under-funding of the state pension plan and retiree health insurance. 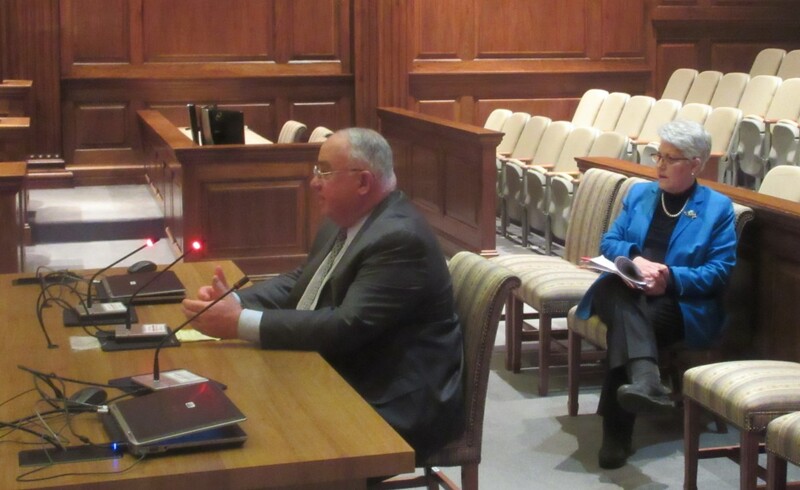 Maryland state treasurer heads a small office that handles state debt, bond issues, management of public funds and the state’s self-insurance program for liability. The treasurer is the third member of the Board of Public Works that votes on almost all state contracts over $25,000. Kopp served in the House of Delegates for 27 years representing Bethesda, and was considered one of the fiscal experts on state government before her election as treasurer in 2002. She serves as the chair of the Board of Trustees of the State Retirement and Pension System, and on the Board of Revenue Estimates. Kopp told the committee she’s worked very hard to increase the transparency of the Board of Public Works and to communicate with legislators about projects in their districts. The retirement system board is “very aware of the challenges of the pension fund” and she defended its investment performance. Campbell and Kopp each spoke and answered questions for about 25 minutes. In the end, the committee’s six Democrats voted to recommend Kopp and the three Republicans abstained.